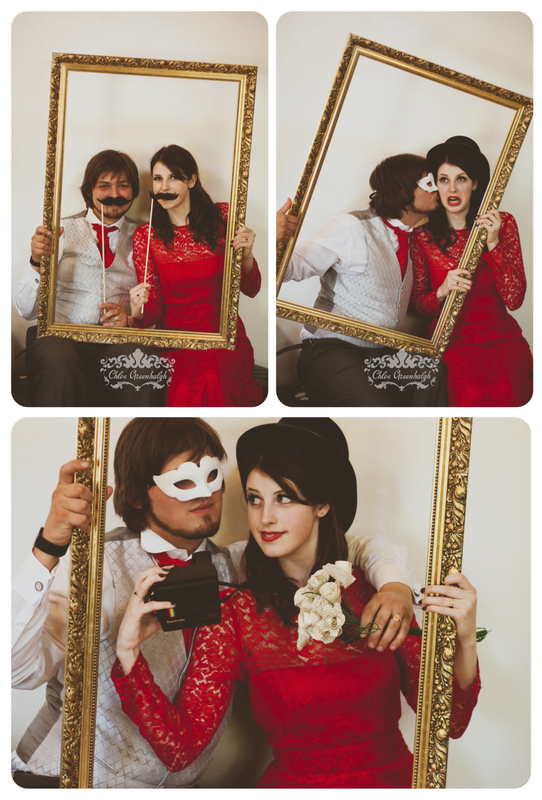 Here is the first, and long over-due, blog about my wedding. It shall be long and include many photographs, so maybe settle yourself down with a nice cup of tea and some biscuits. Chocolate ones probably. 24th August and my wedding day dawned, grey and gloomy. I wanted to type bright and sunny, but it wasn’t, though it wasn’t raining either, so I was reasonably contented. I woke up at the crack of seven o’Clock and swiftly drank several cups of tea to calm my nerves. Getting ready with my bridesmaids was nice and my Mum had tied red ribbons onto all the trees and hedges along the path outside our house. 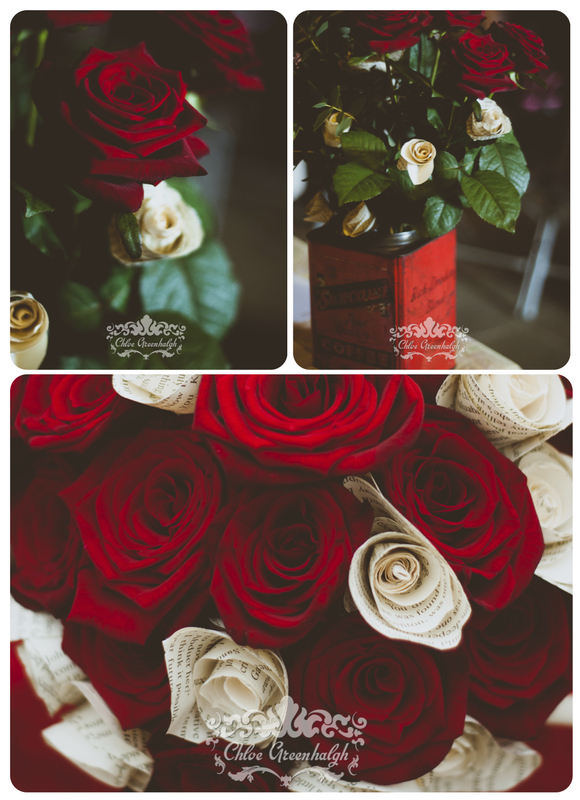 The florist delivered my bouquet, which was beautiful, made of red roses and the book page flowers I seem to have been making for the past 10 centuries. If you didn’t know, the theme of the day was books, as we met in a library, and it was a theme we carried through to the cake and the decorations and our vows and pretty much everything. We really love books. They’re pretty great. Our ceremony was at Beechenhill Farm in Ilam, Derbyshire, which was 10 minutes from our reception venue Hamps Hall & Barn. Both venues were rural and countryside-y, with pretty views and nice beams that were perfect to hang bunting from. I made all of my wedding decorations myself, from the fabric and book page flags, to the heart-shaped confetti, red-framed quotes, and paper flowers. 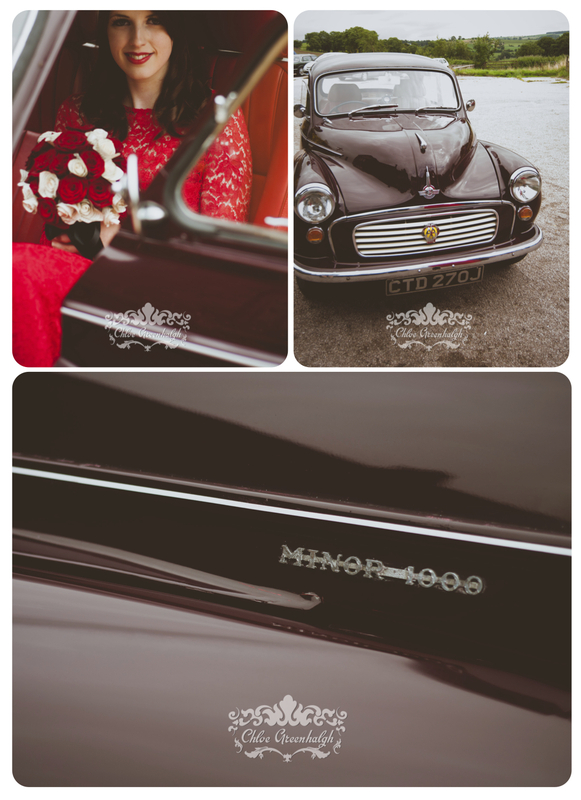 I arrived at the ceremony in a red vintage Morris Minor. It was the wedding car I had been searching for for months and months, and had almost given up hope of finding, until a week before the wedding I finally stumbled upon someone that owned one, and was prepared to drive about the Staffordshire countryside for me. If you ever need a vintage car, I definitely recommend Graham! It was a little windy up in the hills but that didn’t matter once we were inside the barn, which the Groom and Best Man had covered with bunting and fairy lights, as well as the flowers, arranged in some fabulous vintage tins I picked up from the Treacle Market a couple of month’s a go. The ceremony itself was a blur. A lovely, special, teary blur. With Harry Potter quotes, and Brambly Hedge readings, and Beatles music. And tears. Did I mention those? Everyone looked so lovely. 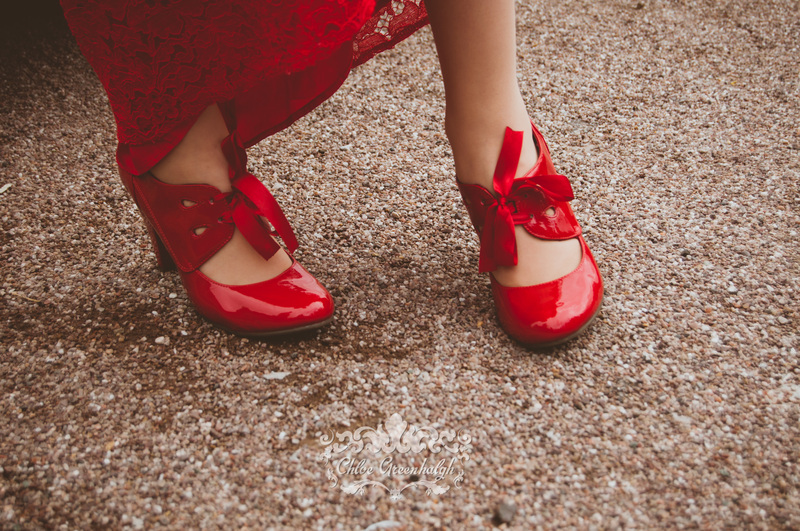 The bridesmaids were in black dresses and red shoes with little bows. And the boys looked rather dashing in grey. They had feathery, book page button holes, too. 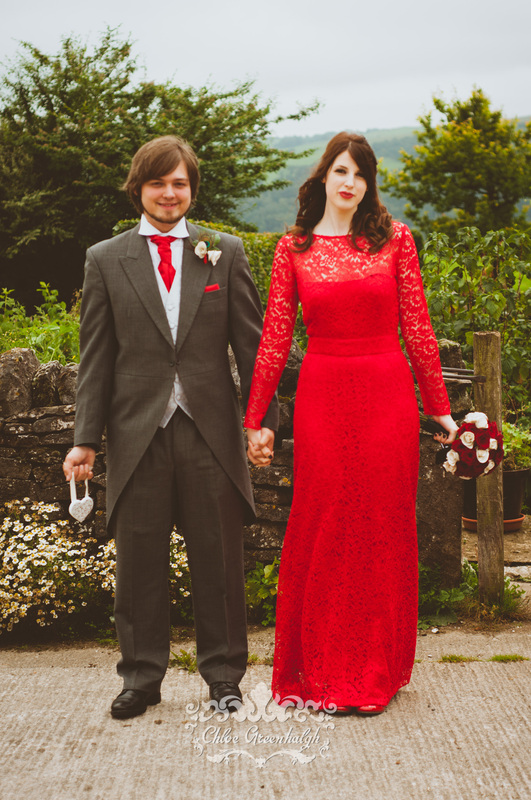 The bride was in red, but enough about her. Then we took a few snaps. Our photographer was the lovely Chloe Greenhalgh and she took all the photographs I’ve used in this post. After that it was time to go to Hamps Hall & Barn, and all the delights it held, but you’ll have to wait a bit longer to hear about that! ← Make, Do & Meet On The Move! 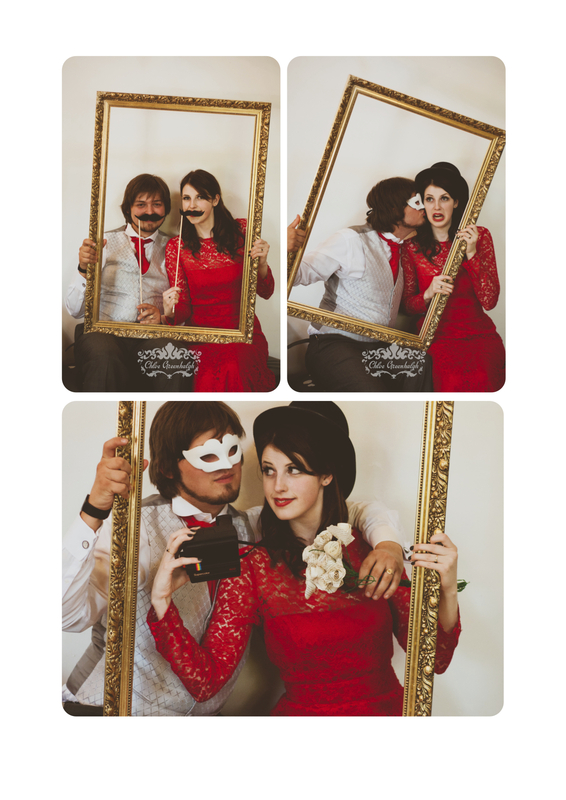 Absolutely love this blog- we get a real feel for the intimate wedding ceremony and setting The book theme was such a brilliant idea- you are sooooo creative Laura!! many, many congratulations!